When you are ready, send me a Canada Want List, and I will see what I can help you with!!! Pat, that is a great looking stamp which I have never seen before. Thanks for sharing. A good morning Saturday stamp! A goofy little guy indeed! Always makes me smile. This Canadian stamp is Scott #204 that was issued on Aug. 17, 1933. The "Royal William" was launched in Apr. 29, 1831 and was the first seagoing steam propelled ship built in Canada. Beautiful MikeC99 !!!! With all those Canada stamps you been posting here, you making me appreciate my Canadian collection more and more each day. Thanks Buddy!!! The parcel-post rates current in 1893 made the issuance of 20-cent and 50-cent stamps desirable. 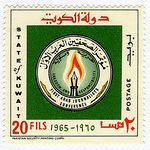 The stamps were larger than the other denominations in current use. Portrait of Her Majesty Queen Victoria, similar to the non-postal one dollar bill stamps of 1868. Kacyds, I glad you like the Canadian stamps I posted. I really enjoy the early engraved one. That is a nice "widow weeds" pic of Queen Victoria. This Canadian stamp is Scott #272 issued on Sep. 16, 1946. It depicts the logging industry in British Columbia. 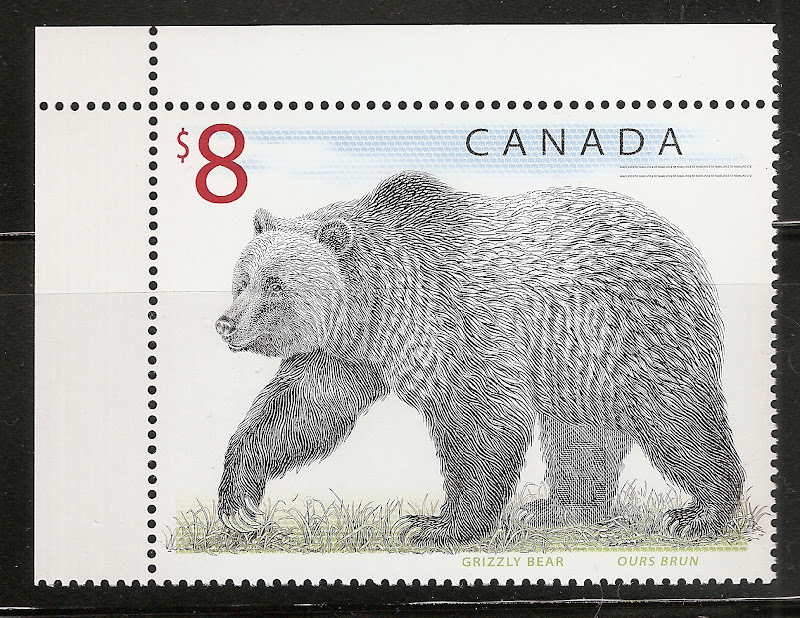 This Canadian stamp is Scott # 1690 and was issued on Oct. 27, 1998. The stamp has a great polar bear cancel. I was sorting through my GB and came across this little jewel. It's not so much the stamp but the signature on it. It almost looks like an autograph. 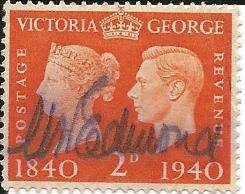 The stamp is Scott #255 issued May 6, 1940. Bear, I'm so pleased that you like the polar bear stamp and cancel. Great stamp Mike,hope to get one someday for my album. This Canadian stamp is Scott #1687 issued on Oct.27, 1998. It also has a very nice cancellation. Here is one that has us scratching our heads..
Too bad Bear drools too muck. He may get the stamps wet.